Severnaya Verf shipyard (United Shipbuilding Corporation) has launched the lead corvette of Project 20385, the Gremyashchy, today, on 30 June 2017. The shipyard says that mooring trials will begin in August. When moved to the outfitting quay, the ship will be powered from the shore. More than a hundred of major suppliers across Russia and over 3,000 contractors are involved in the construction. 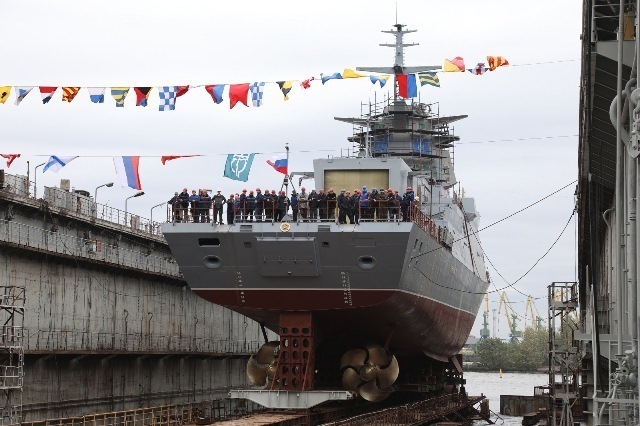 Severnaya Verf Director Igor Ponomoryov emphasized that the corvette of Project 20385 developed by Almaz Central Marine Design Bureau has improved characteristics with the previous projects. According to Igor Ponomoryov, the corvette will leave for sea trials in spring. The ship is to be delivered to RF Defence Ministry by the end of 2018. The high specification warship of near maritime zone is designed to combat surface ships, submarines, to provide air defense and artillery support for the landing and amphibious operations. Advanced stealth technology is used to reduce the ship's radar signature, as well as its acoustic and optical signatures. Vessel of Project 20385 have a displacement of 2,200 tonnes, length of 104 mertes, breadth of 13 metres, maximum speed of 27 khots, cruising range of 3,500 miles, endurance of 15 days and a crew of 99. The propulsion system consists of two 1ДДА-12000 units. The corvette is fitted with two Russian-made 1DDA-12000 diesel turbines, a 100 mm A-190-01 naval gun, two AK-630M30-mm anti-aircraft cannons, Kalibr-NK land-attack cruise missiles, a launcher for the Redut (Redoubt) air defence system, a Paket anti-submarine torpedo system, The vessel also has a flight deck and hanger for a Ka-27 naval helicopter. OJSC "Severnaya Verf" Shipyard (corporate member of United Shipbuilding Corporation) is a among the leading shipbuilding companies of Russia’s defence industry. The company was founded on November 14, 1912, as "Putilovskaya Shipyard." Since that time the shipyard has built more than 600 warships and commercial vessels including missile cruisers, antiaircraft ships, antisubmarine ships, destroyers, passenger ships, bulk carriers, container carriers, Ro-Ro ships, tugboats, support ships, ferries and floating docks. The shipyard’s backlog of orders currently includes the series of frigates, corvettes and other vessels.